Riding a wave of nostalgia, and a timely relevance to volatile world markets, that optimistic orphan Annie is back to warm the hearts of theatregoers all over again. 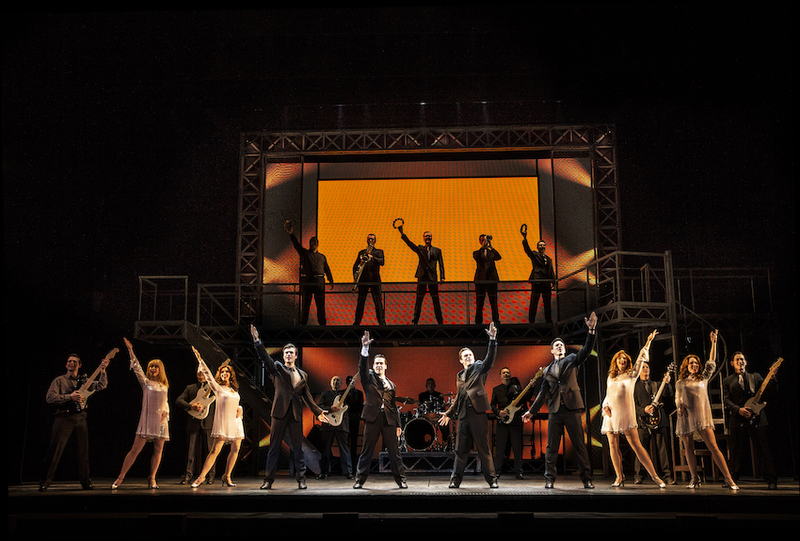 Foremost in attraction here is the supremely talented cast. The orphans dance with utter confidence and belt out their tunes with the volume of twice as many grownups. 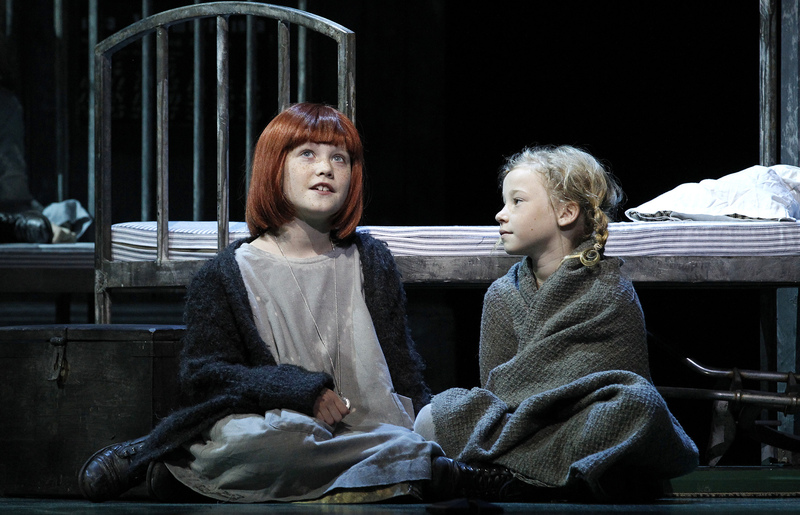 The adult cast are without fault, each gifted far beyond what is required of them in Annie. The well loved story sees irrepressible orphan Annie (Ella Nicol) chosen by Grace (Julie Goodwin) to stay with millionaire, no, billionaire Oliver Warbucks (Anthony Warlow) while still hoping to find her real parents. Curmudgeonly orphanage matron Miss Hannigan (Nancye Hayes) gets her just desserts after trying to help her brother Rooster (Todd McKenney) and his current girlfriend Lily St Regis (Chloe Dallimore) impersonate Annie’s parents. 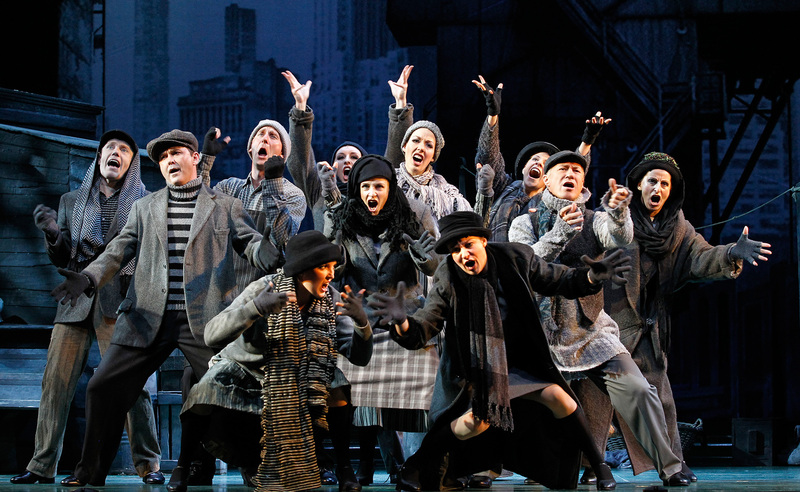 Coming well after Broadway’s Golden Age, Annie nonetheless shares the features and success of earlier musicals, outliving many in terms of repeat stagings. Producer John Frost has ignored WC Fields’ advice about children and animals to dust off his 11 year old production for a new national tour. More cynical theatregoers might view the exercise as merely a money-making plan, but can a new generation of ten year olds be denied the happy memories this reviewer has of going to a city theatre for the very first time? Packed with plenty of comic strip incident, and with much for both the child and adult choruses to do, Annie generally holds up well in terms of entertainment value. Somewhat annoying in the score is the brief reprise of almost every song just after it is first sung. Modern mechanised scenic design has no need for this old device, so the action between scenes slows to a crawl. Lesser known songs such as “Hooverville” and “You Won’t Be An Orphan For Long”, judiciously cut for the 1982 movie, offer limited appeal. It will be interesting to see how the score is altered and updated when the new Broadway revival, long on the horizon, finally arrives. Set design by Kenneth Foy is certainly effective, if not particularly inspired. The move from the grey walls of the orphanage and the Hooverville shanty town to the lush colour of the opulent Warbucks home are a nice homage to The Wizard of Oz. One of the cutest touches is a painting, clearly done by Annie, sharing Warbucks wall space with such treasures as the Mona Lisa. Projections work well during the company number “N.Y.C.” but the animated aeroplane to Washington is cringe worthy and should be scrapped immediately. Kristian Fredikson’s costume designs complement the set well, particularly the greys of the orphanage rags. A witty touch is Miss Hannigan’s red dress with white collar that reads like a dowdy ‘old lady’ version of Annie’s cute trademark outfit. Nicol did a lovely job as Annie on opening night, keeping her speaking voice clear and her singing voice strong. Jade Gillies is an adorable Molly. 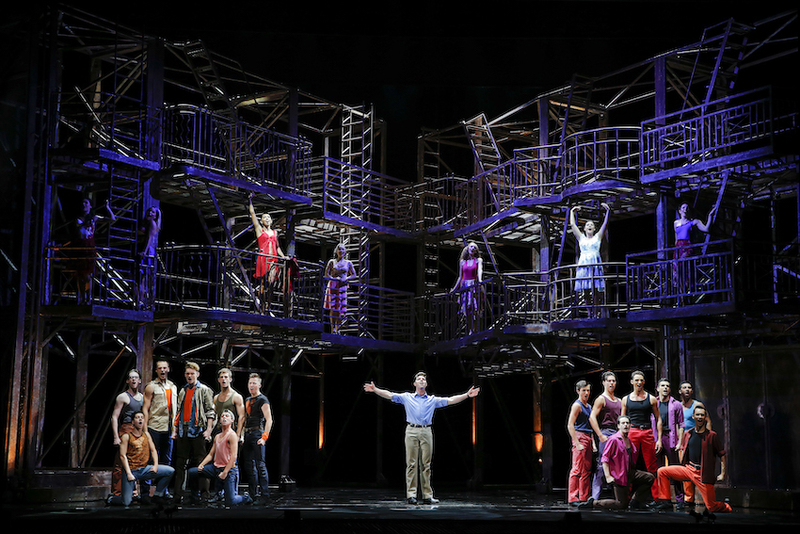 All of the orphans sing and dance with focused, determined power, slaying in particular with their reprise of “You’re Never Fully Dressed Without A Smile”. Mickey is completely adorable and well trained as loveable mutt Sandy, his every entrance eliciting sighs and gasps from the crowd. Warlow is luxury casting indeed as Warbucks, a role he infuses with blustery charm but which barely gives rise to his universally adored singing voice. A sterling portrayal overall. 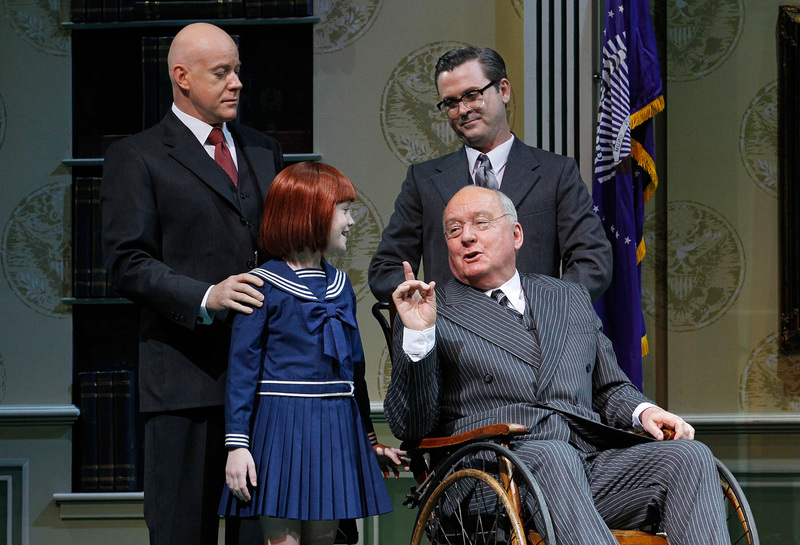 Urchins and puppy dogs aside, Goodwin practically walks away with the show, elevating the somewhat forgettable supporting role of Warbucks’ secretary, Grace. Gorgeous, golden and glowing, her soprano recalls a young Shirley Jones or Barbara Cook and her performance augurs extremely for future leading roles beyond this (and Maria in 2010’s West Side Story). 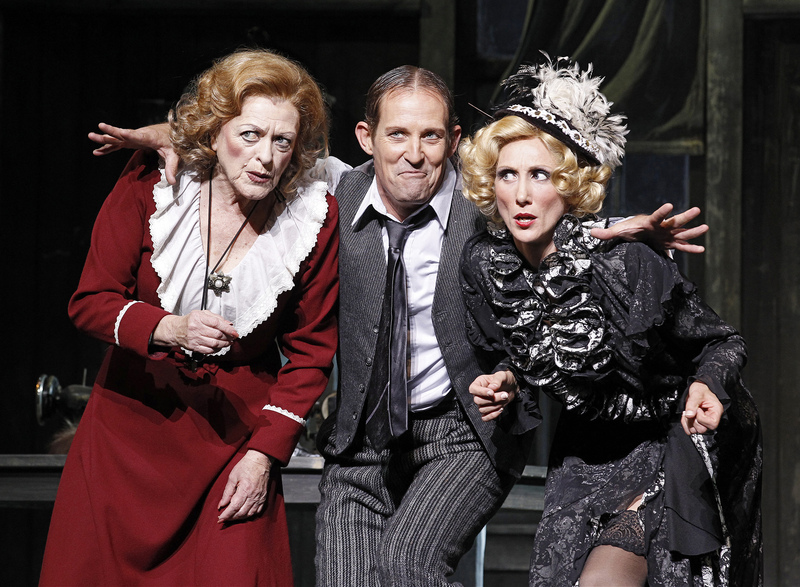 Seasoned music theatre afficionados will cherish the sight of Hayes, McKenney and Dallimore tearing up the stage in “Easy Street”. A more accomplished set of triple threats is hard to imagine. Hayes has the energy, verve and chutzpah of a woman thirty years her junior, nailing every withering putdown with consummate ease. Her adorable accent suggests Betty Boop gone to seed. McKenney and Dallimore are a welcome delight, lighting up the stage for their all too brief appearances. Versatile Luke Joslin stands out amidst the talented ensemble, having a field day as the dandy Bert Healy, singer of the unfailingly catchy “You’re Never Fully Dressed Without A Smile”. Jack Webster doles out spritely charm as Drake, tapping his way into our hearts in the final scene. See Annie with your kids, your grandparents or perhaps your best friend. Chances are you will float out of the theatre with fewer troubles than you took in with you.